The Martians are back! 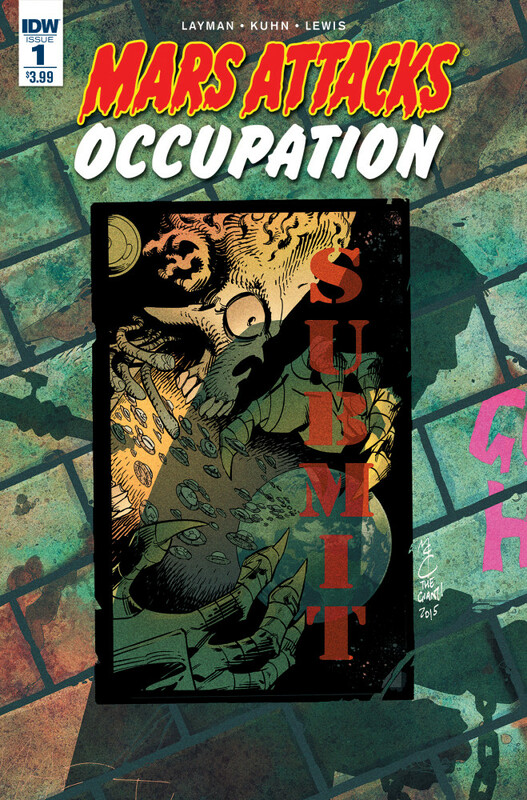 IDW brings us back into the world of Mars Attacks this week, with a new series, Occupation. The Martians have won the battle and humans are subjugated under their rule. Layman and Kuhn introduce us to Ruby Johnson, the daughter of a former boxer who fought against the aliens and didn’t survive. Ruby would love to rise against her oppressors, but goes about her regular routine until an attempted attack against her brings the attention of the Martians. While I enjoyed the original film, Mars Attacks!, it wasn’t necessarily a world I needed to be brought back into. Having passed the previous comic attempts, I can’t speak to them, but Occupation so far lacks the dark comedic tone that made the movie charming to begin with. What the creators did successfully pull off was making us interested in Ruby and her journey. Having established her character, the real test will be whether or not they can inject the humor expected from the property into future issues, because it was sorely missed in the first issue.